Thick rings of bright red-purple leaves in spiral rosettes. 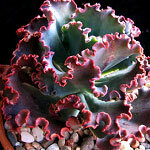 As they grow crests will develop, very unusual plant. Sunny position free-draining soil protect from frost and don't get rosettes too wet.